About Us | German Sport, Inc.
German Sport Parts & Service, Inc. has been in operation since 1986. The original shop was in Concord. As our business increased, we realized that a much larger facility was needed — centrally located, with easy freeway access. Finally, in 1996 we moved into our current space just off North Main Street in Walnut Creek. Our address may have changed, but our commitment to our customers is the same. In fact, German Sport Parts & Service, Inc. has received top honors for our customer satisfaction. Your car gets treated just as well, with the best replacement parts available. And we guarantee our work, parts and labor for 12 months or 12,000 miles. Carlos Suarez (shown on right) has over 30 years of experience in European auto repair. 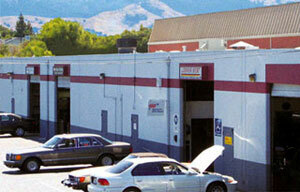 He has worked at various auto repair shops in the Bay Area since 1983. Carlos is an ASE Certified Master Technician and has received advanced training in fuel injection by the Bosch Corporation. 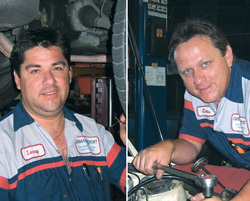 Lerry Suarez (shown on left) has been involved in the auto repair industry since 1986. He has a Bachelor’s Degree in Business Administration from Heald Business College. 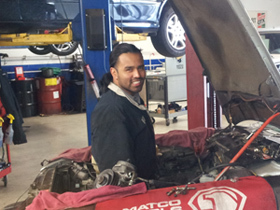 Lerry first learned how to work on cars from his brother Carlos, and has since become an ASE Certified Technician. The hood ornament doesn’t make your car great. From the Alps to the Autobahns, Europeans drive on some of the world’s most challenging roads. It’s no wonder their automotive engineering is first rate. A European car also needs first-rate maintenance. The experts at German Sport Parts & Service, Inc. will keep your fine engine and chassis performing brilliantly. And if that hood ornament gets old and shabby, we can fix it too.